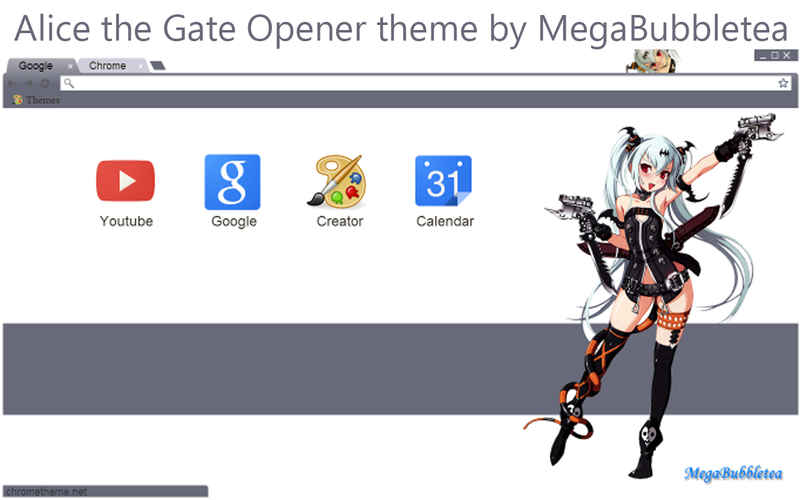 Here is a theme as requested by wMMfreak (check out his YouTube profile) featuring Alice the Gate Opener from the visual gamebook, Queen's Gate. I decided to go with a gray on white theme that suits Alice's darker shades of her hair. A lighter, aqua/green version of the theme will also be available soon! For now, this theme is available for download now on the Web Store. You may have known about Google releasing a 64-bit version of their browser in the beta channel but now Google has finally released the 64-bit version of the Chrome web browser for Windows 7 and 8 into its stable channel, after first releasing a version in its beta development channel in July. This means that Windows users who have opted to get the 64-bit versions of the OS can now run a version of Chrome that is fully optimized for their system. The 64-bit version is shown as an optional download on the main Chrome website. A 64-bit version for Mac OS owners is still in beta testing. "64-bit Chrome offers many benefits for speed, stability and security. Our measurements have shown that the native 64-bit version of Chrome has improved speed on many of our graphics and media benchmarks. For example, the VP9 codec that's used in High Definition YouTube videos shows a 15% improvement in decoding performance. Stability measurements from people opted into our Canary, Dev and Beta 64-bit channels confirm that 64-bit rendering engines are almost twice as stable as 32-bit engines when handling typical web content. Finally, on 64-bit, our defense in depth security mitigations such as Partition Alloc are able to far more effectively defend against vulnerabilities that rely on controlling the memory layout of objects." Also, Google Chrome 37 is out now with improved font rendering and various bug fixes. Google Chrome 37 has been released to the stable channel for Windows, Mac and Linux desktop users. The headline change in Chrome 37 will, for most, be the introduction of DirectWrite support for Windows. As we highlighted during its time on the beta channel this modern technology improves the appearance of font rendering on supported Windows systems, including Windows 7 and Windows 8. Chrome 37 also includes 50 key security fixes, many of which have been contributed, flagged or fixed by external researchers. As is tradition, Google won’t share the full list until the majority of Chrome users have been successfully updated and patched. But, among the handful it has highlighted, there are bug fixes for ‘V8, IPC, sync, and extensions’ that potentially allowed remote code to run outside of the Chrome sandbox, and the closing of a loophole that could’ve enabled the permissions dialog of an extension to be spoofed. Rounding out the changes are the new app and extension APIs for developers to toy with, and the usual improvements under the hood to boost app stability and overall performance.